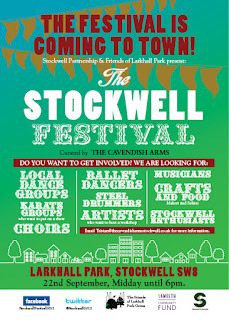 The Stockwell Festival is coming to town. Put the date in your diary now - 22nd September from midday in Larkhall Park. The festival has a different format this year, as well as dance groups and choirs there will be an Adults Zone with a bar and comedy tent and a Carnival Kids area with entertainers and a bouncy castle mini village. The South Lambeth Market will be laying on three zones: a Foodies Market (for cold foods and gourmet treats), Arts, crafts and retro clothing, and a bric-a-brac table top sale. 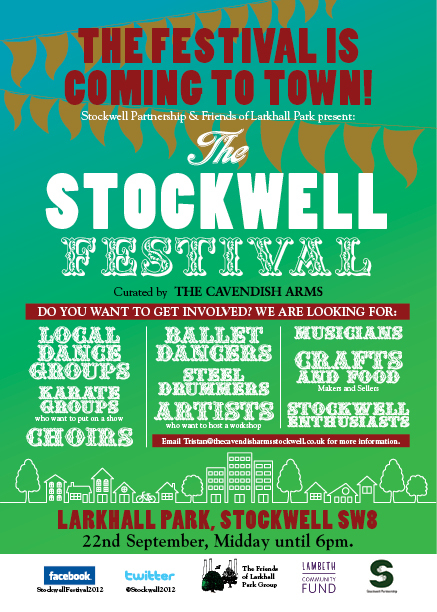 The organisers are looking for volunteers to get involved - specifically local dance groups, ballet dancers, karate groups, choirs, steel drummers, artists, musicians, crafts and food, and 'Stockwell enthusiasts'! For more details, contact the organisers below. Getting involved: To take a stall in the South Lambeth Market areas contact Ian at southlambethmkt@btinternet.com by Friday 10 August 2012. When is Raksha Bandha 2016? It's a very beautiful! Thank you for sharing!